Hilton Hotels are the flexible destination for business and family travelers. 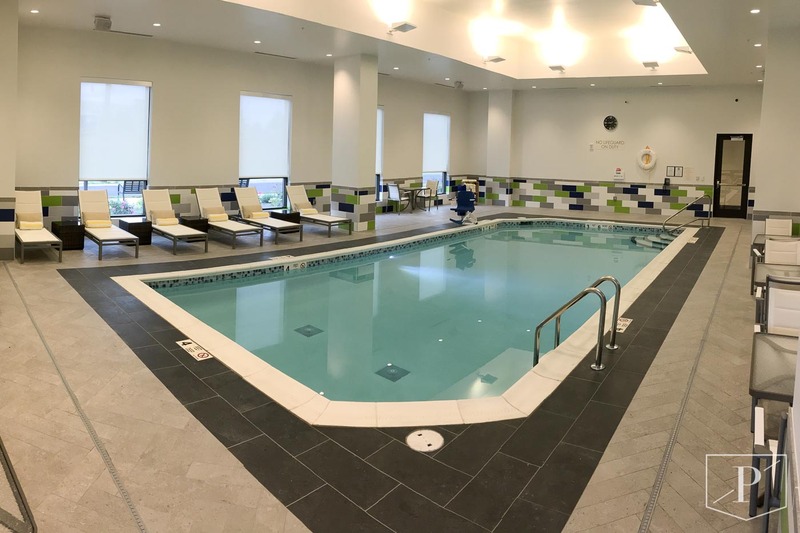 Because hotels get so much traffic, varying from business executives to families, to tour groups, we designed the most accessible pool possible to accommodate. Designing an indoor pool, in a hotel isn’t only about maintaining compliance though it is a large influence on designs for commercial pools. We were able to build a balance of compliance and usability to make the pool attractive for all the hotel guests, year round. The far end of the pool is perfect for accessibility. The clear paths and wheelchair accessible entrance lead right to the ADA approved handicap lift for anybody needing assistance into the water. In the corner we built a gradual entry step system and integrated handrail to help people in and out of the water who needed stability. There is a second ladder is adjacent the lounge area. The pool depth is 4 foot deep with a shallower transition near the accessible end at 3 1/2 feet. The Pentair heater in the pool ensures that you can enjoy the water all year round at a consistent temperature. While the indoor environment gives the pool an advantage to control heat loss, it doesn’t avoid the fact that we are in Syracuse, NY where winter is a serious season.